The main difference between different flooring materials and their suitability for use with heated floors systems is the material’s thermal conductivity, meaning how quickly and efficiently heat generated transfers to the floor surface. The best flooring for underfloor heating is flooring with good conductivity as it heats up quicker, gives more heat output and is more efficient to run. However, this does not mean that underfloor heating could not be used under less conductive materials and there are systems available for use with virtually any floor finish. Whether you’re renovating or choosing flooring for a new construction, we outline in this article what you need to know about different flooring for underfloor heating. The best type of flooring to use with underfloor heating is tile and stone. 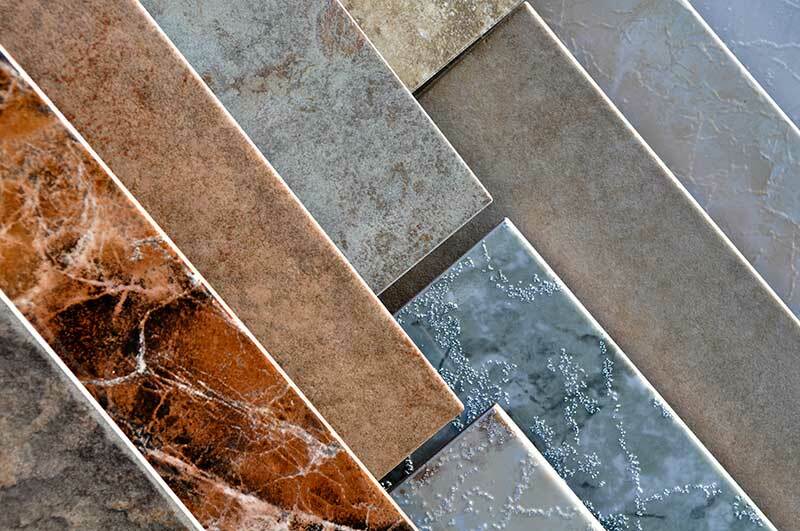 Tile and stone have high thermal conductivity, meaning that the heat from an underfloor heating pipe or wire transfers to the floor surface quickly. Tile and stone also retain heat well making the system efficient. Due to the excellent thermal properties, tile and stone are ideal for use with underfloor heating in high heat loss areas such as sunrooms. They can be heated to up to 84°F or more. The thickness of the tile and stone has little impact on the heat output, but it does increase the heat up time a little so sticking to a maximum thickness of 3/4″ is recommended when you’re seeking a highly responsive system. Read more about heated floors installed under tile or stone. Tile and stone floors are highly conductive making them the best flooring to use with heated floors. Different types of wood flooring have different thermal properties, as such there are differences in their suitability for use with an underfloor heating system. The more dense and the thinner the floor boards are, the better they conduct heat and typically more suitable they are for use with underfloor heating. Engineered timber is the best type of wood flooring to use with an underfloor heating system as it performs well with changes in floor temperature. Other wood floorings may also be used, but with softer and less dense wood attention must be paid to the thickness of floorboards so that the floorboards do not act as an insulator blocking the heat. As a general rule for wood flooring, the floor surface temperature must not exceed 80.6°F. Heated Floors Systems can be used with different wood flooring types, but attention must be paid to the thickness of the floor boards so that they do not act as an insulator blocking the heat. Read more about underfloor heating installed under wood or watch this installation video. Vinyl flooring can be safely used with underfloor heating. Vinyl heats up and cools down quickly. Vinyl floors are subject to a top floor temperature restriction, usually 80.6°F (27°C), limiting the heat output so they are not recommended in high heat loss areas such as older sunrooms. Read more about installation under vinyl and LVt’s. Carpet is suitable for use with underfloor heating, provided that the material of the carpet or underlay does not act as an insulator blocking the heat. The total tog of all materials, including any under and overlays, must not exceed 2.5 tog in order for the system to provide sufficient heat output. Read more about underfloor heating under a carpet. 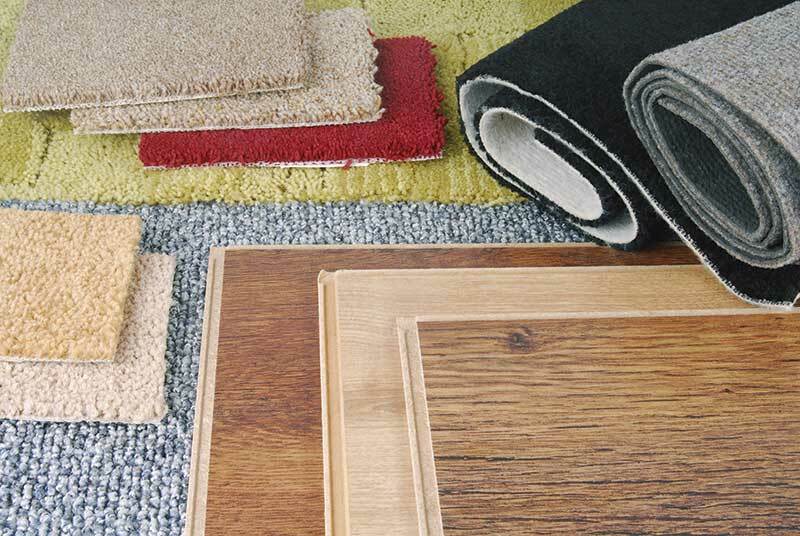 Laminate and carpet flooring is suited for use with heated floors, but you must ensure that the total tog of all materials does not exceed 2.5 tog for the system to provide enough heat output. The choice of flooring material affects the heat up time, as each material has different thermal mass and conductivity. The lower thermal mass and higher the conductivity, the quicker the heat from an underfloor heating pipe or wire transfers onto the floor surface. However, this also means that materials with low thermal mass cool down faster than materials with high thermal mass. The responsiveness of a heated floors system can be improved by using insulation boards to promote the transfer of the heat to the floor finish. It’s important to ensure that the heat output from the floor is greater than the heat loss figure of the room. 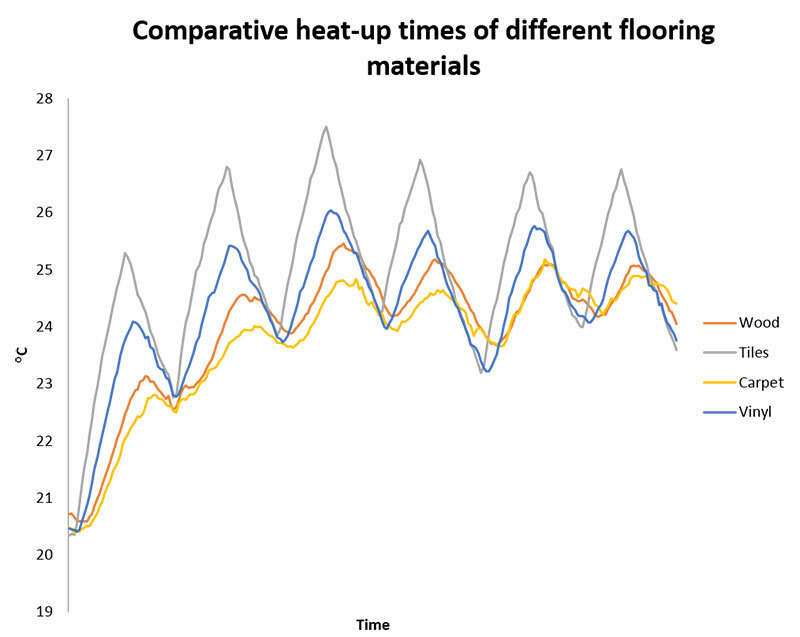 As the graph below illustrates, a two-degree difference in the floor temperature makes a great difference in heat output. So, if your chosen flooring can only be heated to 80.6°F (27°C), and this does not give you the heat output you need, you may benefit from changing to a floor finish that can be heated to 84°F (29°C) to give more heat output. Additionally, you can consider adding supplementary heating to ensure your heating system meets your expectations. The maximum heat output is directly linked to the floor temperature. 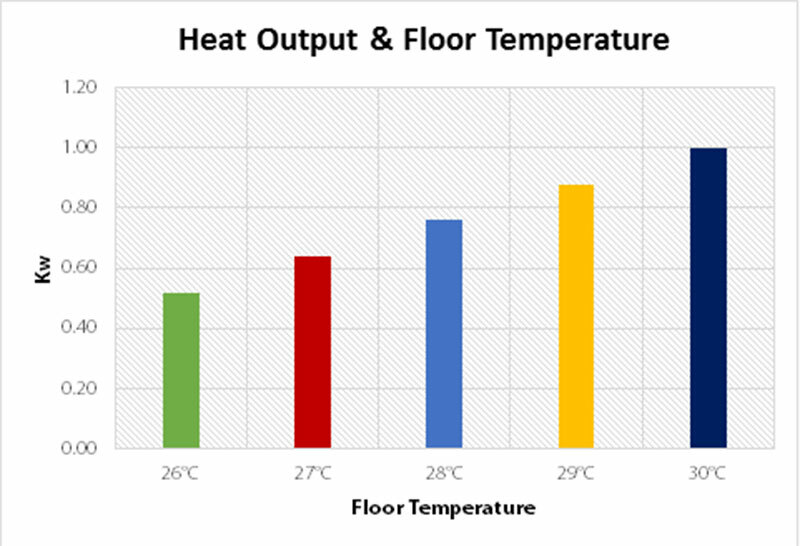 The graph illustrates the maximum heat output of heated floors systems when the desired room temperature is 21°C (70F) and the heated area 100sqft. If you’re looking to get underfloor heating, take a look at our Radiant Floor Heating Product Selector to find a system suitable for use with your chosen floor finish. >> Did You Know Warmup recently released a new range of Electric Heated Towel Rack? Check them out!